THE man who designed the Daleks, the metallic villains who thrilled generations of children on television's Dr Who. died after months of starving himself, an inquest heard yesterday. 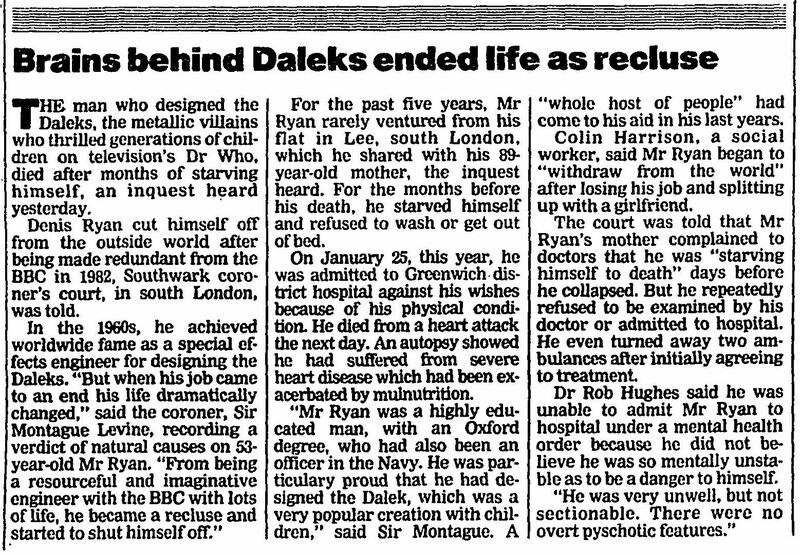 Denis Ryan cut himself off from the outside world after being made redundant from the BBC in 1982, Southwark coroner's court, in south London, was told. In the 1960s, he achieved worldwide fame as a special effects engineer for designing the Daleks. "But when his job came to an end his life dramatically changed," said the coroner, Sir Montague Levine, recording a verdict of natural causes on 53-year-old Mr Ryan. "From being a resourceful and imaginative engineer with the BBC with lots of life, he became a recluse and started to shut himself off." For the past five years, Mr Ryan rarely ventured from his flat in Lee, south London, which he shared with his 89-year-old mother, the inquest heard. For the months before his death, he starved himself and refused to wash or get out of bed. On January 25, this year, he was admitted to Greenwich district hospital against his wishes because of his physical condition. He died from a heart attack the next day. An autopsy showed he had suffered from severe heart disease which had been exacerbated by malnutrition. "Mr Ryan was a highly educated man, with an Oxford degree, who had also been an officer in the Navy. He was particulary proud that he had designed the Dalek, which was a very popular creation with children," said Sir Montague. A "whole host of people" had come to his aid in his last years. Colin Harrison, a social worker, said Mr Ryan began to "withdraw from the world" after losing his job and splitting up with a girlfriend. The court was told that Mr Ryan's mother complained to doctors that he was "starving himself to death" days before he collapsed. But he repeatedly refused to be examined by his doctor or admitted to hospital. He even turned away two ambulances after initially agreeing to treatment. Dr Rob Hughes said he was unable to admit Mr Ryan to hospital under a mental health order because he did not believe he was so mentally unstable as to be a danger to himself. "He was very unwell, but not sectionable. There were no overt pyschotic features." APA 6th ed. : (1994-09-23). Brains behind Daleks ended life as recluse. The Guardian p. 2. MLA 7th ed. : "Brains behind Daleks ended life as recluse." The Guardian [add city] 1994-09-23, 2. Print. Turabian: "Brains behind Daleks ended life as recluse." The Guardian, 1994-09-23, section, 2 edition. This page was last modified on 16 August 2017, at 02:44.